Content Marketing Panel at TOCA 2018 Annual Meeting, featuring from left to right Veronica Biczo, Bethany Chambers, Matthew McArdle, and Jason Schmaderer. 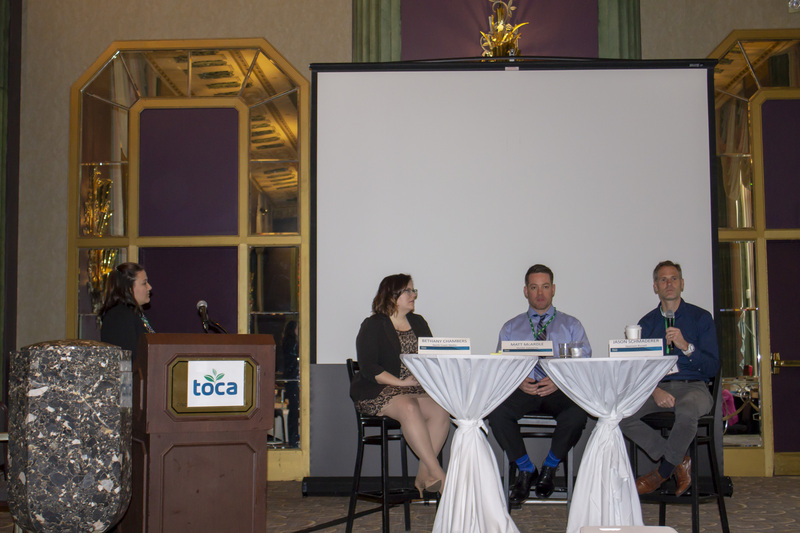 During the content marketing panel discussion at the annual TOCA meeting in Cincinnati in May, experts representing the green industry media, agency, and manufacturer perspectives shared the latest trends in content marketing. 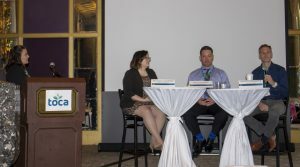 Bethany Chambers, director of audience engagement at North Coast Media, Matthew McArdle, creative copywriter at Hunter Industries, and Jason Schmaderer, account director at Swanson Russell were panelists. Veronica Biczo, public relations manager at Ewing Irrigation & Landscape Supply, moderated the discussion. The word “content” encompasses many different forms of media, and within the subject of content marketing, there are multiple terms and buzzwords used throughout the industry. The discussion among panelists began with definitions. What is content marketing, why is it important, and what are the benefits of it? Chambers explained that North Coast Media’s content marketing committee defines content marketing as, “the marketing technique that emphasizes the communication and distribution of relevant, interesting, and educational content that is targeted to the audience and meant to generate engagement.” She also defined sponsored content as the content itself and native advertising as one delivery method that exists within the content marketing technique. Chambers cited research from the Content Marketing Institute indicating that customers preferred reading articles over traditional ads. She went on to explain how quality content contributes to building a reputation, and that while traditional advertising is useful at generating buzz and building excitement, it is less effective than content marketing at building lasting relationships with customers. McArdle described content marketing as anything that brings value to their customers and helps them engage with the brand and build trust with them as a manufacturer. Content marketing allows a manufacturer to be a trusted source of information, education, and value for customers. From the agency perspective, Schmaderer defined content marketing as any quality information that helps move someone along the decision journey. He described traditional marketing as being about the interruption. Today, customers are in charge, and they choose when to engage. How do you measure the effectiveness of content marketing? Quantitative metrics, like click-through rates, time on pages, social shares, and the number of followers, are useful indicators to measure the effectiveness of content. Social media also provides qualitative data, like customer comments, which allow marketers to adjust their campaigns in real time based on real-time feedback. How do you get approval to spend resources on content marketing? McArdle spoke to the corporate marketing side from the perspective of Hunter Industries, explaining that managers can see value and results from content marketing. While he did not see it as a big challenge, McArdle suggested sharing analytics with managers to gain support and funding for content marketing. How should PR folks share their content with editors? Chambers shared advice for building successful relationships with the media. Get to know the editors, and only send content that is relevant to their audience. Go to your media partners, ask about opportunities and share your expertise. Submit your news in a timely fashion. Most importantly, build relationships. Chambers said that events like the TOCA annual meeting are increasingly incredibly important for your PR strategy because it is an opportunity to build relationships. Regardless of whether you are in the publishing, manufacturing, agency or association side of the green industry, try these expert tips from the panelists for creating remarkable content. Use mixed media and multiple platforms. Select delivery channels based on your audience and the message. Vary content to keep it fresh. Inspire your audience to think differently. Embrace digital content like videos and social media. Don’t be generic in your content. Try new things and test them. Less is more. Do a few things very well. Share content that is relevant, valuable, and entertaining. This entry was posted in Calendar by Amy McDonald. Bookmark the permalink.